Those who know my car (once seen never forgotten!) will be aware that it runs 12Volts. As a special it was cheap and easy to start from the beginning with 12Volts, both for electrical reasons and cheapness of parts! The 12Volt conversion used a popular “solid state” regulator which may be familiar to some of you. Basically it monitored and regulated the charge voltage and thus the current by electronic means and therefore worked very well. In fact the ammeter always showed a small (1A) charge no matter what the load on the system was. However several conversations with Club members and some internet forum discussions gave rise to some concerns about the durability of the device. Being a solid state device it is susceptible to damage from “spikes”. Jump starting or a flat battery are know to be fatal to the device! The fear was that a breakdown miles from home would be “unfixable”. The solid state device was “potted” and thus fault finding is impossible and the dynamo had been converted to 2 brush operation. Both of these facts could cause a headache for roadside repair jobs! I wanted to go back to a 3 brush dynamo with some form of adjustable charge control to allow a bit more selection than the standard half or full charge. Internet discussions came up with several resistors rigged up to give a “switchable range to replace the standard half charge resistance. This led to the logical conclusion of a rheostat! Given the standard half charge resistance value and the 3 ohms or so for the field coils a value of 0 -5 ohms was chosen for the rheostat, which was thought to be good for a 12 volt system. The worse case scenario for the rheostat would probably be 12Volts flowing through the field, giving something like 4 amps and 48 watts flowing in the field at the “full charge” setting (in reality this probably wont arise). Because of this a suitable size rheostat needs to be used. I managed to buy a 150watt item off ebay from Canada as ex military old stock for about £23 air freighted to the UK in about 3 days! Be cautious though as a similar spec bought from an electrical supplier in the UK can cost a lot more than that! All that is required is to fit this rheostat in place of the standard half charge resistance i.e. across the D and F terminals. You can now manually control the current flowing in the field coils and therefore alter the charge rate. I mounted the rheostat on the bulkhead and use a shaft through to the dash to allow adjustment from the drivers seat, although on a special this is easier than it may be on an original car. You can and should still use the 3rd brush to limit charging and remember that between 8-10 amps seems to be the sensible draw from the C35 dynamo, which is no problem at 12V with 36 Watt headlight bulbs. Of course this leaves the cut out! An essential device to prevent the battery trying to turn the engine over via the dynamo! 12v Cut outs seemed to be difficult and expensive, so I decided after being offered much advice that a Schottky diode would be the cheap and much simpler alternative to the electro mechanical cut out. They are available in all manner of specs, but the one I settled on has a 30A rating with a reverse breakdown voltage of 45 Volts. 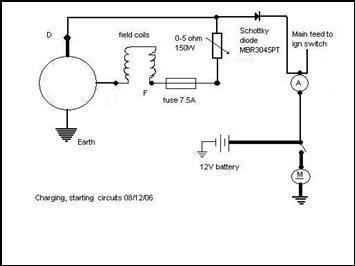 Basically the Schottky diode allows current to pass to the battery via the ammeter , but does not allow current to flow back from the battery (technically a small amount does flow backwards). Thus it does an excellent job of replacing the cut out and has the advantage of only costing £1.71 from Maplins, so you can carry a spare or 2! You should ensure that it is purchased with the correct silicone mounting pad to allow it to be heat sunk to a piece of aluminium or a bulkhead to dissipate the heat and prevent premature failure. A battery master switch is a wise fitment too as the small leakage current can cause problems after long periods of time, and I am informed that the failure mode of the Schottky diode is short circuit so it no longer acts as a diode and an isolator switch would prevent any damage! And that’s it! All you actually need for the 12Volt conversion is the schottky diode to act as cut out, total cost £1.71! You could just put an extra 1 ohm series resistance in the field to limit the current , but the rheostat conversion gives you that bit extra fine adjustment! Of course bulbs will need changing and a 12Volt battery purchased, and a resistor is needed to limit voltage to the petrol gauge if you have one. The conversion is as easy to fault find or repair as the standard system with no complicated circuitry at all. This article, written by Steve Martin, originally appeared in CA7C Seven Focus in Mar 2007 p16-17.